Once again it’s time to look back and see where I traveled in the past year. A trip to one of my favorite places, Big Sky, Montana. As usual, finding award seats was a challenge. Add in the fact I had a friend traveling from Memphis with me and another friend in Nashville who wanted to use miles and we decided it was cheaper to take an extra day off work and leave on a Friday rather than buy a ticket to fly on Saturday with the rest of the ski club. Splitting a hotel room made that an obvious choice for us. With American Airlines flying into Bozeman for the first time this ski season, I’m hoping that in the future there will be more award space available than on the Delta flights. My second ski trip was to Vail, Colorado. I had no problem finding award space on the flight to Denver, which meant I could easily meet up with my ski club there. However their return flight was in the late afternoon and the only DEN-MEM flights with award space were in the morning. So I either had to pay for my own transportation back to Memphis or fly back from the Vail/Eagle County airport (EGE). Even though I had to book ground transportation from our condo to EGE, it was much cheaper than shuttling two hours back to Denver. I took a long weeked to visit friends. One lives in Chicago and the other in Milwaukee. So I flew into Chicago and spent a night there before we drove up to Milwaukee for the rest of the weekend. Another weekend trip out to Denver and my first-ever summertime visit to Vail. I’d originally purchased a MEM-DFW-DEN ticket for Friday night but my flight got cancelled. To get me to Denver as early as possible the next morning I was re-routed via … Charlotte. I didn’t love getting up so early to catch that flight but I did get into Denver on time so for that I’m thankful. A non-stop on Frontier proved to be the cheapest route home. My longest trip of the year was a cruise on the Danube River. I hope to start posting about it soon. I flew to Chicago to meet up with my trip roommate and from there we flew to Prague via Brussels. After a couple of days there we took a bus, a train and a taxi to Nuremberg, Germany, where we began our cruise, and floated to Budapest, Hungary. On the return trip I had visions of using my Miles & More miles to stop at Lufthansa’s First Class Terminal in Frankfurt but no award space ever opened up. Not the most glamorous of travel destinations but I’d never been to any of the European cities that I visited and it was good to go back to some places that feel like home by now. Next year will bring more new destinations in the form of a trip to Asia as well as going back to some familiar ski resorts. 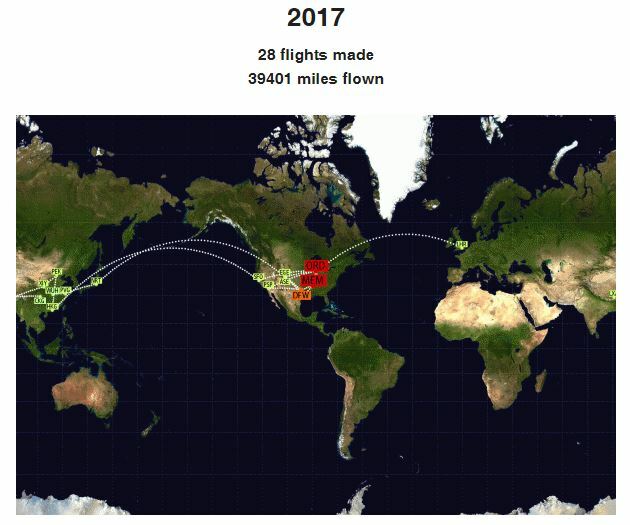 Where will 2017 take you? 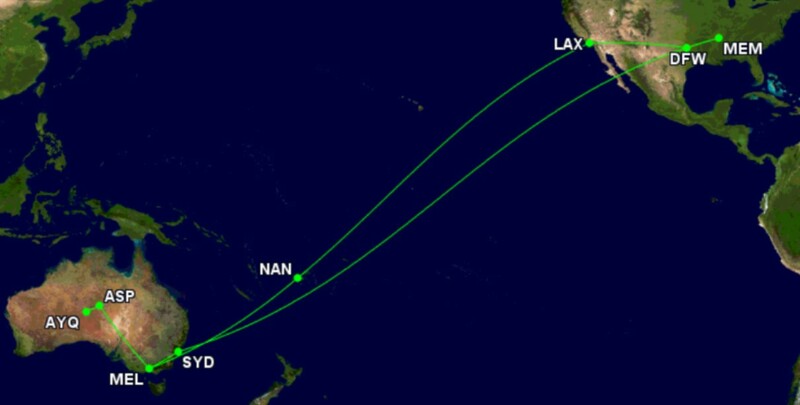 In 2014 I flew longer and further than I had done in quite some time but in 2015 I actually flew even further and longer thanks to my two week trip to Australia and Fiji. Domestically, ski trips took me to Steamboat Springs (Haden via Atlanta) and to Salt Lake City (via Dallas/Ft. Worth) and visits to my friends sent me to Los Angeles (via Houston on the way out and via Denver on the way back) and to Chicago (ORD). The good thing about my domestic travels was that every trip was either paid for with airline miles, credit card points or travel credits from a credit card. None of the trips were free but the points, miles and credits sure help to keep the costs down! Internationally my Birthday-With-A-Zero extravaganza sent me to Sydney (via DFW), to Ayers Rock (AYQ via MEL and ASP/Alice Springs), to Melbourne (returning via ASP), to Nadi (NAN), Fiji and home to Memphis via LAX and DFW. 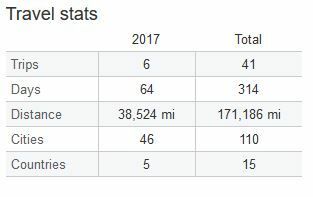 So despite two trips across the Atlantic last year, I flew 1500 miles further and had 4 hours more in flight time than last year. I choose to think that those extra miles and hours were spent aboard the Qantas first class flight from Dallas to Sydney. You’d never think a 17-hour flight could pass so quickly! I won’t be flying further or longer in 2016. I’ll still have two trips but my international trip is to Europe and some of the ground there will be covered via a river cruise. I’m looking forward to seeing what the new year brings! Where will your travels take you in 2016?